The interior of the Grand Floridian Resort and Spa is depicted in this Christmas jigsaw puzzle. Christmas decorations appear in mid-November and remain until the beginning of January. 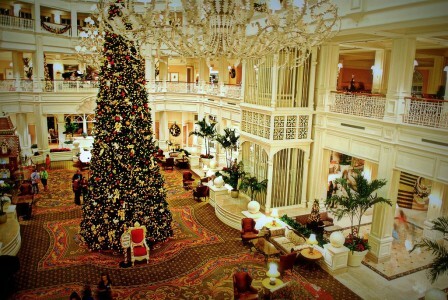 During this time, guests visiting the Walt Disney World Resort flock to the Grand Floridian Hotel to experience the sights and sounds of the Christmas season. In addition to the grand lobby tree, the Grand Floridian Resort and Spa also features a gingerbread house, made from fresh gingerbread shingles. In the gingerbread house, there are numerous hidden Mickeys, strategically placed for guests to find. The red chair in the jigsaw puzzle is an area for Santa Claus pictures, which is staffed by a resident Kris Kringle until Christmas. Credit: Special thanks to tcwmatt for making the photograph used for this jigsaw puzzle available through the Creative Commons Attribution NoDerivs license. Visit tcwmatt's Flickr photostream. See all jigsaw puzzles based on tcwmatt's photographs.